Why let the kids have all the fun? 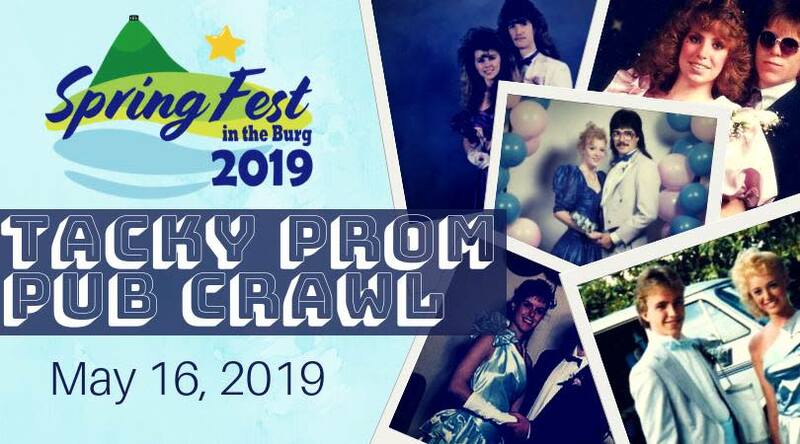 Grab your date or get your friends together to show off the best of the worst you have to offer for Spring Fest in the Burg's Inaugural Tacky Prom Pub Crawl! Dressing up is not required but highly encouraged. Stop by all the participating businesses and turn in your ticket at the end of the night to be entered into the raffle for some amazing prizes. All locations will have drink specials from 6-9 pm! Prom tickets will be available for $2 presale or $3 at the door and the event is 21+. Follow us on Facebook for more updates as we get closer to the event!